Here's part 2 of the Germantown Valley View Game, score at half was 28-3 in favor of the Spartans. I promise, there's more Rider highlights than Spartan highlights this half....just not enough. In this clip: Riders find the endzone for the first time...45 yd TD run by Tom Reusser, key block by #33 Chris Hostetler (Coach Mac and McGrew agree). Long pass play by Valley View gets brought back by a holding call....Renauld Ray (just subbed in) intercepts the next pass. In this clip: The Riders take a turnover and produce one of their own. Bad throw into double coverage. Leads to another Valley View TD....a potential 28-17 deficit turns into 34-10. That may have been the final nail in the coffin. In this clip: Riders have to punt at midfield (not sure about a run on 3rd and 5)..and Valley View chews up clock with a long drive. In this clip: Spartans continue to eat clock into the 4th quarter...even the most loyal fan had to wonder if we were just going to run out of time. Jon Haley picks off a Spartan pass setting up another long run by Tom Reusser, this time from 38 yds. In this clip: 2 pt conversion is good (nice grab Tommy! ), score is 34-18. But a 40 yd run on 3rd down by Valley View kills the Riders....the defense just can't get off the field as the clock nears 6 minutes. In this clip: Riders finally hit the big pass play...Justin Zwick hooks up with Marcel Denson on a 64 yd bomb. The 2-pt conversion was no good (looked open, but only for a few seconds). That kept the game at 2 scores. If they'd have converted, it would have brought them within 8. 34-24 Spartans. Just noticed #56 in that clip, I think that's Eric Sauers. In this clip: Riders make one more drive, but it, and the season ends on a tipped pass that gets picked off, I think that was the 5th turnover in the game for the Riders, 3 of those were in Spartan territory. Final: Germantown Valley View 34 - Orrville 24. In this clip: Post game awards, this is a tough one to watch, a lot of dejection on the sidelines, the guys wanted no part of that runner-up trophy and who can blame them.....had to be a tough time for the guys. I and a lot of others thought that after we throttled Benedictine (54-27) that there wasn't a team in the state in D4 that was going to beat us...except maybe ourselves. But Valley View made the big palys and kept our offense off the field, they did enough to win. On a personal note, I know a lot of the guys that were on this team, and as a group, they deserved a much better outcome, they worked hard to get to this point, and while there can only be one winner, they did the town and the school proud. 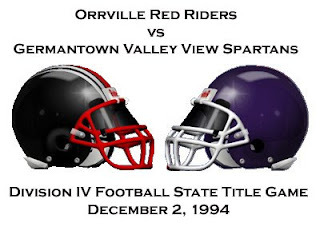 They were only the 2nd Rider team to win 12 games in a season, and the wins over Wauseon and Benedictine were two of the most memorable Orrville playoff wins in the school's history. I hope you enjoyed the look back, even though it's still painful (at times) to watch.